Got my first Žižek experience yesterday. I was simultaneously impressed and underwhelmed. My only exposure to his work until today had been through the plethora of other authors citing him these days, and through a friend who enthusiastically appreciates his iconoclasm and originality, and also does a killer impression of the man. I have been meaning to read something by him for a while, and will probably get around to it sooner rather than later now. Anyway, Slavoj Žižek was lecturing at Birkbeck College in London, as is his wont. The theme was “The Uses and Misuses of Violence”. Basically he was tackling the question of why normal people inflict atrocious violence on others when they, by all accounts, are caring and considerate of their comrades and family. He started with former Maoists turned Zionists and ended with Stalin (one of his favourite subjects), and made many entertaining and often enlightening digressions along the way. The basic idea was that idealists are invariably aware of the imperfection or even downright infamy of the people they idealize, in this case Mao, but revere them even more because of that fact, because it lends their aspirations a kind of empyrean air. Had Mao been a benign ruler, he would not have inspired such zealous idolization, but languished in history book obscurity instead, he argued. Using the example of Proust talking on the telephone for the first time, with his grandmother whom he describes as the disembodied voice of an unknown, old woman, Žižek reconfigured the biblical concept of the “neighbour” as a alienating conception of a person, with whom we do not have to engage emotionally. This naturally leads to transgression, and is the reason close family of Stalin, for example, described him as a loving family man. This led Žižek to what he himself described as an ‘apologia/ non-apologia’ for Stalinism. He compared with the revolutionaries who went before, and quoted a rather chilling passage from Trotsky, describing man as something imperfect that should be improved upon. As if he were a machine. He went on to describe the constructivists as profoundly anti-human, and in many ways much worse than the social realists that came to the fore with Stalin. Eisenstein and company, he argued, never had any support from the broad public; they were elitist and obscure. Social realism was what everyone wanted, and when Stalin purged the cultural field of anything not fitting into his ideological program – it was welcomed by the people, Žižek maintained. By what appeared to me a short-circuit of argument, Žižek followed this by maintaining that, had the constructivists and their ilk maintained power, things would likely have turned out even worse than they did, Gulag and all. While typically controversial and definitely unexpected food for thought, this appeared to me something of a specious argument. First of all, this alternative was completely hypothetical since most of these people did – as he himself pointed out – not have broad support, neither with the people nor with the establishment that Stalin represented. They were the freak thinkers of an unusual moment, not nation-builders. Secondly, it is just plain hard to believe that anything could be worse than Stalin’s reign of terror. The constructivists would have to work quite hard at creating their utopian world of man-machines for that to happen. Žižek then proceeded to dissect democracy as an ideological guarantor of civilization, another of his perennials. A pessimist, he does not believe globalized capitalism to be a potentially benign force to be harnessed by the multitude, the way that for example an Antonio Negri does. He rather sees it as an ultimately oppressive reality, and a great challenge to the contemporary Left to counter. Deeply sceptical of our current configurations of democracy, he admitted that he had no hard and fast answers and was himself profoundly conflicted as to what should be done. In what seemed to me a further logical disconnect, he suddenly suggested public disobedience on a massive scale, in an effort to discredit the “democratically elected” politicians totally. Using the last years of Tito’s Yugoslavia as an example, he argued that a “democracy” that has been thoroughly discredited by the people will no longer have to pander and keep up its charade, but be forced to do its best to improve things. Using José Saramago’s recent novel Seeing as a poetic example, he suggested a massive manifestation of blank votes as described in that book constitute a kind of violence beyond the banalities of infamy, the kind of “Divine Violence” originally alluded to by Walter Benjamin. This all seemed incredibly speculative, and not a little utopian, to me, despite Žižek’s persistant insistence that he was a pessimist in these matters. In the Q&A when the question of the Middle East inevitably arose, he did, however, offer up a kind of earthbound qualifier. He pointed out that what he called “miracles” actually did happen from time to time, and offered the 1971 peace between Israel and Egypt under Sadat as an example. This resolution of the conflict between the two countries had till then been regarded as an impossibility, but suddenly garnered support across the political spectrum. Žižek emphasized that he did not believe in “age-old” hatreds, such as the alleged one between the Israelis and the Palestinians, that are impossible to transcend. They are political inventions of the moment, he argued. All in all, it was an enlightening session, despite the fact that counter-intuitive logic can only be taken so far before turning to absurdity, and despite the distinct utopianism of the concluding remarks. Contrary to what I had expected, it was not so much the idiosyncrasy of Žižek’s arguments that impressed me – most of what he said was only original in presentation, and much less so in substance. No, what did it was the passionate, inquisitive, lucid and totally unarrogant way in which he presented his views. He never claimed to have any answers. Rather, his counter-intuitive argumentation seemed almost Socratic in its method, if not objective: Žižek’s great contribution, it seems to me, is to question received truths, for example our current configuration of Democracy, while keeping his utopianism at a sufficiently abstract level to remain hopefully utopian, rather than descend into dangerous idealism. Žižek lectures regularly at Birkbeck College, London, and has a week-long master class coming up in March – keep watching their website for info. Also, he has a four-week master class on Lacan running through May-June. Also, check this text by José Saramago on democracy, it is interesting reading. 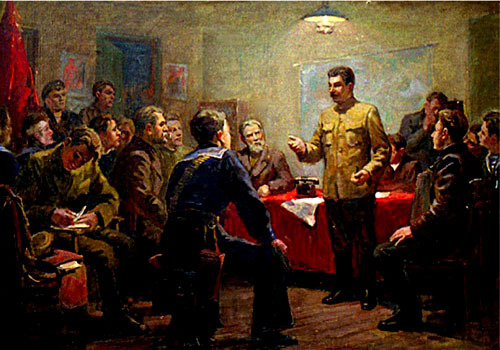 The painting is Karp Demyanovich Trokhimeko’s “Stalin as an Organizer of the October Revolution”, I assume from sometime in the 1930s.